From This Point. Forward. : The End of The Saga? The End of The Saga? Well, I think the saga of trying to use my Rituxan co-pay assistance card is finally over - at least until my next infusion! Earlier this week, the mystical Claim 1500 form with the J codes arrived via snail mail from my doctors office (printed on an old dot matrix printer, no less. Because it may be almost 2016 but apparently medical offices still love to use techniques from 35 years ago!). APL took the forms to work and faxed them (to the 888-332-9864 number that hopefully will be listed on their website in January). 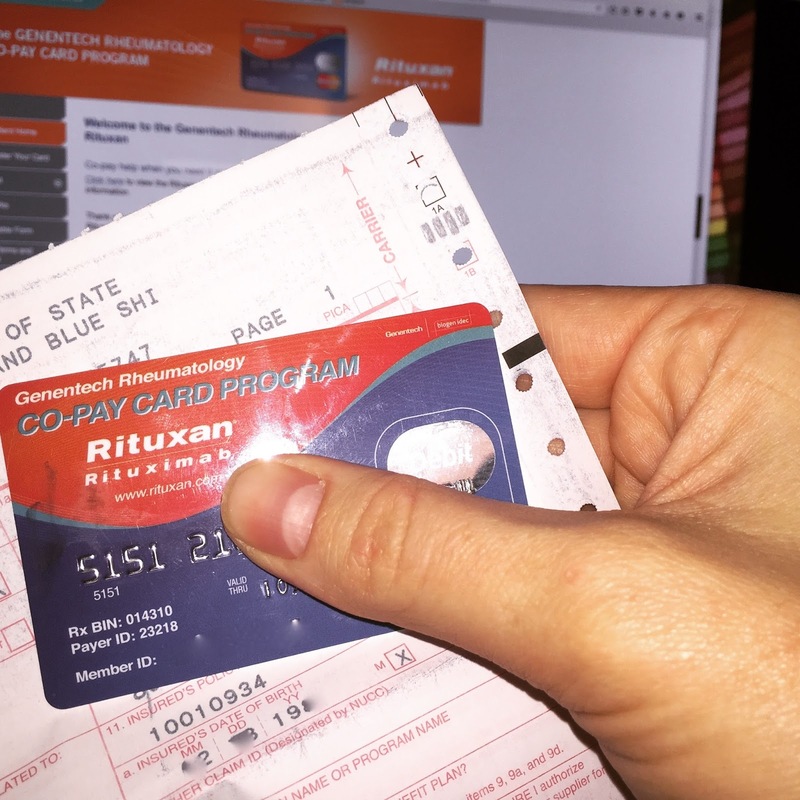 As suggested by the representative I talked to on December 1st, this time we included a fax cover sheet addressed to the claims center and including my Rituxan co-pay card member ID number. Today I got a direct call from the product manager I spoke with on the phone the other day to let me know that my forms had been processed and my card had been funded. Which I guess goes to show you that, in addition to potentially helping others, giving feedback might also help you get some special treatment! That being said, I was so relieved to hear that the whole saga was finally at an end I didn't realize until after I hung up with her that the number she had given me - $2,980.28 - was actually $10 less than the amount I owe on the bill. I looked at the Claim 1500 form to see if I could figure out why that had happened, but it was all gibberish and pre-insurance numbers that didn't match anything else I could see anywhere else. In the end I gave up. The payment for $2,980.28 did actually go through, and I just didn't have the energy to go up to bat again over $10. Guess the next two times I want to treat myself to a latte, I'll just skip it.